I have reported in this Blog that during my stay in Davao last October 2008 the CFD members invited me to join them in their Radio Program. 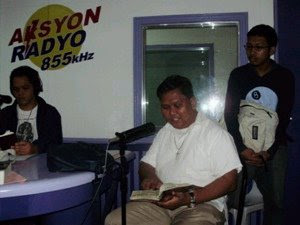 It came out that I was the lone guest that night and I have to answer live questions coming from the listeners from about 6 provinces of Mindanao. There were many questions that night because it is very rare that a Catholic priest is appearing on air to receive direct questions from the Audience. Due to time constraint and the large number of arriving questions many answers here were direct answers that need refining and more thought of answers now. But, I still believe that those who are interested and are new in Apologetics can still learn something from this. The organizers were able to record the said program and they gave me a copy of the audio CD. My young partner here in Sorsogon, Bro. Franz Luigi Lugena uploaded it in the Internet so that now it can be listened to by more people the world over. The language though is Filipino and Visaya.